Though the Wilson Creek wetland and associated nesting colony apparently no longer exist, there continue to be sporadic reports of individual Tricolored Blackbirds in the area, most recently in May of 2017. Best place to look is along Rd 22 NE in the vicinity of Krupp (aka Marlin). But Para Ponds in Adams is the place to go for Tricoloreds now. Also, the Ferruginous Hawks mentioned in the text are reportedly not as evident or numerous as they used to be, though one was reported in April 2016. Be happy if you see one, because they are reportedly hard to find these days. The Wilson Creek wetland no longer exists. That means the nesting colony of Tricolored Blackbirds that formerly used this site, cannot now be seen there. The Para Ponds of Adams County, near Othello, are now the most reliable site for seeing this blackbird in Washington. Some 13,000 years ago, a lobe of the continental ice sheet dammed the Columbia River about where Grand Coulee Dam now stands. Diverted to flow south along a zone of weakness in the plateau basalts, the river gouged away rock and sediments, forming the ancestral Grand Coulee. This chasm was further enlarged by the numerous Spokane Floods that swept across the landscape in the waning years of the last ice age. When the ice sheets receded, the Columbia recaptured its prior course. The abandoned channel now has the form of a wide valley flanked by basalt cliffs. Its upper (northern) end is occupied by a large reservoir, Banks Lake. The floor of the lower (southern) part has lakes—some of them alkaline because there is little or no drainage—marshes, patches of shrub-steppe habitat, and riparian groves. This landscape supports a rich and interesting fauna, including some birds that are unusual away from the coast. Birding is best from spring through early winter. In a normal winter most of the lakes are frozen by January, and birds are few. Even then, of interest are the winter roosts of Gray-crowned Rosy-Finch on the cliffs and northern visitors such as Gyrfalcon and Snow Bunting atop the adjacent plateaus. Our itinerary proceeds from south to north, starting from near Ephrata (pronounced ee-FRAY-tuh). 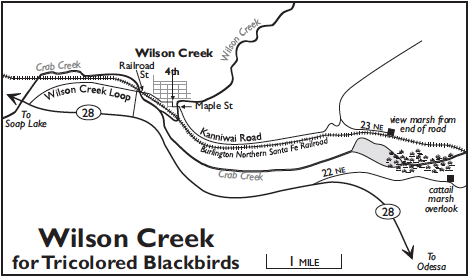 In spring and early summer, birders may also wish to visit the state’s only nesting colony (so far) of Tricolored Blackbirds near Wilson Creek. From the junction of SR-28/SR-283 (14.7 miles north of I-90 Exit 151), go north toward Ephrata on SR-28, 2.4 miles to Martin Road NW. Go left (west) here 0.4 mile to a parking area on the left (south side of Martin Road NW). Walk downhill on a dirt track to the treed area, where berry-laden Russian Olive trees attract loads of birds in winter: accipters, Hermit and Varied Thrushes, American Robins, both waxwings, Yellow-rumped Warblers, and sparrows. Spring and fall, these trees attract migrants. Check the irrigation canal, where American Dipper has been noted. Both Barn and Great Horned Owls are regular, and Barred, Long-eared, and Northern Saw-whet have been seen. After birding this fine area, head back to SR-28 and turn left (north) 0.2 mile to Oasis Park, on the left. Best birding is early morning to avoid highway noise. The park has an RV area and a day-use area, but birders should head for the patches of deciduous trees and main pond south of the parking lot. The pond which can be good for a variety of waterfowl in early spring, including Wood Duck, especially in early morning. Vagrant landbirds have been found around the last week of May. Check the large willow tree by the main pond for nesting Great Horned Owl. Excellent shrub-steppe habitat is close by Ephrata. 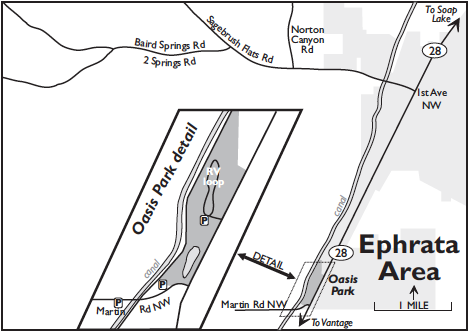 From Oasis Park, go north (left) on SR-28 through Ephrata 2.8 miles to 1st Avenue NW. Go left here (the road becomes Sagebrush Flats Road) 1.5 miles to Norton Canyon Road. Turn right to the grasslands along this road, which are excellent for Grasshopper Sparrow. Lazuli Buntings frequent the brushy draw. American Tree Sparrow can be found along this road in the winter. Travel back to Sagebrush Flats Road and go right 0.9 mile . Turn left (south) on Baird Springs Road (aka 2 Springs Road) for some excellent birding in sagebrush habitat over at least the next three miles. Look and listen for Loggerhead Shrike, Sage Thrasher, and Brewer’s and Vesper Sparrows. Sagebrush Sparrow can be readily found here from mid-June through July and may nest nearby. Though much quieter in winter, American Tree Sparrow can be found. Return to SR-28 in Ephrata, go left (north) toward Soap Lake, and in 5.3 miles find the junction with SR-17. The discovery in 1998 of a colony of Tricolored Blackbirds—the first state record for this species—put the town of Wilson Creek on the birding map. In the same vicinity, the seasonally inundated Crab Creek bottomlands attract many waterfowl, shorebirds, gulls, and terns. Cliffs, talus slopes, and brushy terrain provide nesting sites for raptors, including Ferruginous Hawk, and for a variety of shrub-steppe specialists. There are two turnoffs for Wilson Creek on the north side of SR-28. The west turnoff is about 16 miles east of the intersection with SR-17 at Soap Lake and the other is a mile and a half farther east (24 miles west of Odessa). Use whichever one is more convenient; either way you will be on Wilson Creek Loop. Continue to an intersection and take Railroad Street into town (straight ahead in 1.5 miles if coming from the west exit, or right at a stop sign in 0.3 mile if coming from the east exit). Follow Railroad Street through a couple of bends and turn right onto Fourth Street (0.5 mile). In 0.1 mile turn left onto Maple Street, which shortly crosses a bridge and reaches an intersection with Kanniwai Road, where you turn right. For about two and one-half miles, the road runs through farmlands in a coulee with cliffs on the left, where Ferruginous Hawks have nested, and marshes on the right in places (across the railway track). Tricolored Blackbirds are often noted in mixed-species blackbird flocks in fields along this road, away from their nesting sites in the Crab Creek marshes. Turn right onto Road 23 NE and drive to its end in 0.7 mile at the railroad crossing, again looking for blackbirds and waterbirds in the marshes. Respect private property signs. To observe the nesting marsh, return to SR-28 at the east Wilson Creek Loop exit, turn left, and go 2.8 miles to Road 22 NE. Bear left here, stopping to scope the shallow seasonal lake on the left for swans (Tundra is abundant in spring), geese, ducks, shorebirds, gulls, and terns. In 1.9 miles pull off to the left and walk a few yards (watch out for rattlesnakes) to an overlook of the large cattail marshes where many Red-winged, Tricolored, and Yellow-headed Blackbirds nest. If you have not found Tricolored Blackbird so far, try Road 22NE all the way to Marlin, checking blackbird flocks in agricultural fields along the way. Several sites along SR-28 between Wilson Creek and Soap Lake are worth a stop. (See map on next page.) Brook Lake (aka Stratford Lake) can be scoped from a gravel pullout on the right side of the highway 3.8 miles past the west Wilson Creek Loop turnoff. In fall, this lake hosts upwards of 55,000 Canada Geese. Usually a few Greater White-fronted and Snow Geese are present in this huge throng. Rarities such as Ross’s Goose and Brant have been seen here, too. Look also for Western Grebe and American White Pelican. Continuing west on SR-28, you come to an intersection with Pinto Ridge Road on the right (3.8 miles). If you are visiting during spring or fall migration, you might want to check the oasis at Summer Falls, reached by going 6.1 miles north on this road to the Summer Falls day-use area (closed seasonally). Look for warblers at a willow-lined seep. Continuing west on SR-28, a dirt track turns off left in 4.2 miles. Go a short distance into a patch of Big Sagebrush and Bitterbrush, where Sage Thrasher and Lark Sparrow may be found. It is another 4.1 miles west on SR-28 to the junction with SR-17 at the south edge of Soap Lake. From the intersection with SR-28, take SR-17 north 0.7 mile through the town of Soap Lake to the parking area at the south end of the lake, on the left. Soap Lake is slightly saltier than the ocean and distinctly alkaline—chemically akin to a salty solution of sodium bicarbonate. The reputed curative properties of these waters continue to draw vacationers, while Northern Shoveler, Ruddy Duck, Eared Grebe, and Ring-billed Gull are attracted by the copepods and other tiny invertebrates that swarm just below the lake’s surface in the warmer months. 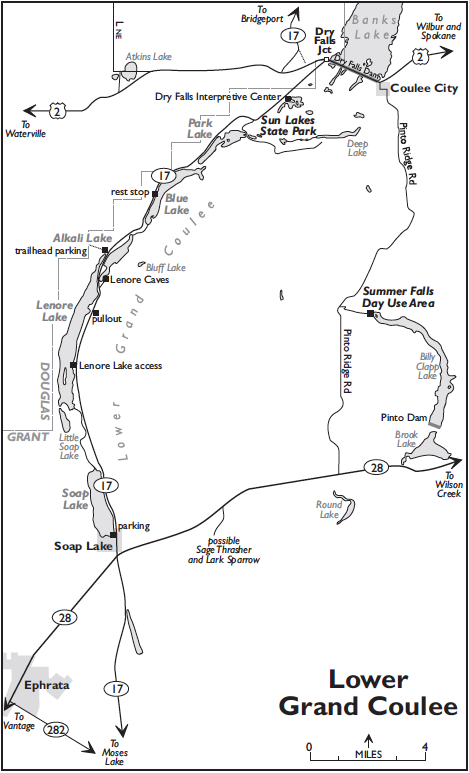 Soap Lake is one of the better spots in Eastern Washington to look for scoters, Long-tailed Duck, and Sabine’s and Franklin’s Gulls (mainly fall). Shorebirds (Sanderling and Pectoral Sandpiper in fall) can be found on this beach as well as on the one at the north end of the lake. Pullouts along the way provide other opportunities for bird-viewing. Much of the valley bottom to the north is occupied by four large lakes within the Sun Lakes Wildlife Area (9,140 acres; Discover Pass required). The southernmost, and largest, is Lenore Lake. Turn off left from SR-17 to a fishing access 6.0 miles north of the south parking area at Soap Lake. Many species of freshwater ducks use the lake, except in mid-winter when it is frozen. Marine ducks such as scoters and Long-tailed Duck are regular. Look for Golden Eagles, which nest in the cliffs across the lake from here. A roadside pullout 1.8 miles farther north, on the right, allows more views of the lake. Several Barrow’s Goldeneyes nest here, an unusual location for this species. The cliffs close by are a reliable winter roost location for Gray-crowned Rosy-Finches. Look for them beginning in late afternoon as they check out the crevices (and perhaps Cliff Swallow nests). Canyon Wren is fairly common here, though often difficult to spot. Another 1.1 miles farther north on SR-17, at a sign marked Lenore Caves, turn left into a parking area. A short asphalt path leads north to a small spawning channel constructed for the Lahontan Cutthroat Trout that were stocked in Lenore Lake. Look for them in the channel from late March through June. Across the highway, take the Lenore Caves turnoff (parking lot in 0.4 mile); you will have a great overlook of Alkali Lake, the next lake in the chain. During spring and fall, large numbers of ducks, coots, and other waterbirds can be observed here. Red-necked Grebes have nested here. A short hike (about one-quarter mile, in places a bit rough) leads to the Lenore Caves—which have been used by humans for at least 5,000 years—and another beautiful view. Some of the species you may observe are Golden Eagle, Say’s Phoebe, and Canyon and Rock Wrens. Continue north on SR-17 to a parking lot, on the left, on the north side of Lenore Lake (1.1 miles). Here, a footpath passes through a fence opening and heads up through a rocky cleft to shrub-steppe habitat and the talus apron at the base of the tallest cliffs. In addition to shrub-steppe species such as Loggerhead Shrike and Brewer’s Sparrow, check for Chukar, Golden Eagle, Prairie Falcon, and Canyon Wren. Rattlesnakes are abundant here. Blue Lake (1.8 miles) can be an excellent inland site for loons in migration. Commons are often present in large numbers, especially in fall, along with a few Pacifics in October. Yellow-billed has occurred. Red-necked Grebe has nested at the south end of the lake in recent years. Scope from the rest stop on the right in another 1.8 miles or from any of the pullouts along the highway. Birds are abundant in the lakes, marshes, and riparian habitats of Sun Lakes State Park (3.1 miles). For a fine morning birdwalk from mid-May to mid-June, park in the lot (1.3 miles) beyond the campground entrance and walk the first mile or so of the 2.5-mile road to Deep Lake. The road follows a stream lined with Water Birch, Red-osier Dogwood, and wild rose. Look for waterfowl, Red-tailed Hawk, Black-billed Magpie, Common Raven, swallows, Rock Wren, Yellow-breasted Chat, Lark Sparrow, Lazuli Bunting, Yellow-headed Blackbird, and Bullock’s Oriole. Peregrine Falcon may nest on the cliffs. Dry Falls is one of the geologic marvels of the state. Stop at the overlook and interpretive display 1.9 miles farther north on SR-17, on the right. In summer, you can often go eyeball to eyeball with White-throated Swifts as they slice the sky right before you. Look for Chukar here, too. In winter, rosy-finches roost in the cliffs below the overlook. The lakes far below often have waterfowl. Scan the skies for both Prairie and Peregrine Falcons. The Lower Grand Coulee ends at Dry Falls Junction, where SR-17 meets US-2 (2.0 miles). Turn left for birding sites on the Waterville Plateau or right to continue to the Upper Grand Coulee. North from the Dry Falls Dam at Coulee City lies the huge Upper Grand Coulee, now mostly flooded by artificial Banks Lake. Filled with water pumped up from Franklin D. Roosevelt Lake with 12 of the world’s largest pumps, Banks Lake constitutes the headworks of the Columbia Basin Irrigation Project. About 2,360 miles of canals and laterals thread their way downslope from Dry Falls Dam to irrigate 640,000 acres of productive farmland throughout the southern Columbia Basin. The lake and most of the shoreline are included in the Banks Lake Wildlife Area. Banks Lake may host birds more often seen along the coast, especially during fall migration. Sea ducks are regular, including inland Washington’s largest congregation of Red-breasted Mergansers (late fall; a few winter). Jaegers are possible. Large numbers of Herring Gulls winter on the lake if areas of open water persist, and Glaucous Gulls are sometimes seen with them. From Dry Falls Junction, drive east across Dry Falls Dam on US-2, checking the waters north of the dam for diving ducks, loons, and grebes. A pullout partway across (1.2 miles from the junction) provides a vantage for an extensive area of lake, mudflat and marsh on the south side of the dam. Blue-winged and Cinnamon Teal, Black-necked Stilt, American Avocet, and Wilson’s Phalarope can often be scoped from here. Swivel your scope 180 degrees across the dam to a rocky island in Banks Lake that supports a large colony of Ring-billed and California Gulls and a few Double-crested Cormorants and Caspian Terns, along with some Great Blue Herons and Black-crowned Night-Herons nesting in dwarf Hackberry trees. Once across the dam, in 0.7 mile, turn right (south) onto 4th Street. Go 0.3 mile to Main Street. Turn left (east) and go 0.2 mile to McEntee Street. Go right (south) 0.7 miles to Coulee City Sewage Treatment Plant. Scan the ponds from the berm on the right for waterfowl (Eurasian Wigeon has occurred) shorebirds, and gulls (Franklin’s noted). Back on US-2, go east 2.3 miles from Coulee City to a junction with SR-155, where US-2 goes right. Keep straight here and head north on SR-155 along the east shore of Banks Lake. A pullout and overlook at a large notch in the cliff (7.8 miles) is a great place to see nesting White-throated Swift, Violet-green Swallow, Canyon Wren, and occasionally Peregrine Falcon. In fall, check for Common Loon and flotillas of Red-breasted Mergansers on the waters far below. Banks Lake Public Access (1.0 mile) goes to the lake, passing a dense patch of Big Sagebrush filled with Brewer’s Sparrows (April through July). SR-155 parallels the lakeshore to the turnoff to Steamboat Rock State Park (6.7 miles). On the way, stop at as many pullouts as time permits. Greater Scaup, mergansers, Common Loon, and Horned Grebe may be found in fall and spring. Note the large Cliff Swallow colonies on cliffs beside the highway. After turning into the park, a dirt road goes off to the left in 0.4 mile. Walk this road to a grove of Russian Olives beside a cattail marsh. Check the trees for Barn and Long-eared Owl, American Robin, Varied Thrush, and American Tree Sparrow (winter). The park has a developed campground with ornamental plantings that attract migrants in season. Chukar and Gray Partridge occur here. Berry-consuming birds such as California Quail, American Robin, Varied Thrush, and Townsend’s Solitaire are especially common. The ready prey attracts accipiters; Northern Goshawk is regular in winter. For the hardy, a steep trail ascends to the top of mesa-like Steamboat Rock. Although not particularly good for birds, the rock is famous for its display of Bitteroot (May and June). Bald and Golden Eagles and Prairie Falcon nest here. Bats roost in the cliffs, including the rare Spotted Bat. North from the park entrance on SR-155, a bay known as Devils Punchbowl hosts Western Grebe families in summer and hundreds of mergansers in fall, including many Hooded and Red-breasted. Scan for these from one of the many pullouts. The gravel road into Northrup Canyon turns off right in 3.4 miles and ends at a gate (0.6 mile). The park is in a natural state, with no facilities other than a wide trail along a canyon lined by towering granitic rocks. These witnesses of the older rocks that underlie much of the Columbia Basin protrude up into the otherwise widespread, and recent, Columbia Plateau basalts. The canyon has scattered forests of Ponderosa Pine and Douglas-fir and a riparian corridor lined with Water Birch and dense brush. Resident bird species include Chukar, Golden Eagle, Great Horned Owl, Northern Pygmy-Owl, Downy and Hairy Woodpeckers, Northern Flicker, Black-capped and Mountain Chickadees (may hybridize here), Red-breasted Nuthatch, Canyon Wren, Song Sparrow, and Red Crossbill (irregular). Spring brings many migrants and summer visitors, including Long-eared and Northern Saw-whet Owls (possibly year round), Common Poorwill, White-throated Swift, Calliope Hummingbird, Lewis’s Woodpecker, Red-naped Sapsucker, Western Wood-Pewee, Say’s Phoebe, many House Wrens, Lazuli Bunting, Bullock’s Oriole, and Cassin’s Finch. During the warm months, the parking lot by the gate is a good place to find Spotted Bats—identifiable at night by their clearly audible clicking. In late fall and early winter, dozens of Bald Eagles fly into the tall conifers in late afternoon to roost. Their cacklings and wild aerobatics against the backdrop of the cliffs are an exciting spectacle. This is one of the largest roosts in interior Washington, with over 100 birds in some years. Numbers decline when arctic air masses arrive in late December or January, and Banks Lake freezes. If you follow the trail all the way to the old homestead, you can then turn left (north) and go higher up into the canyon to a more challenging single-track trail uphill to beautiful Northrup Lake—actually more of a pond. Species to look for there include: Osprey, Virginia Rail, Mountain Bluebird, and Cassin’s Finch. 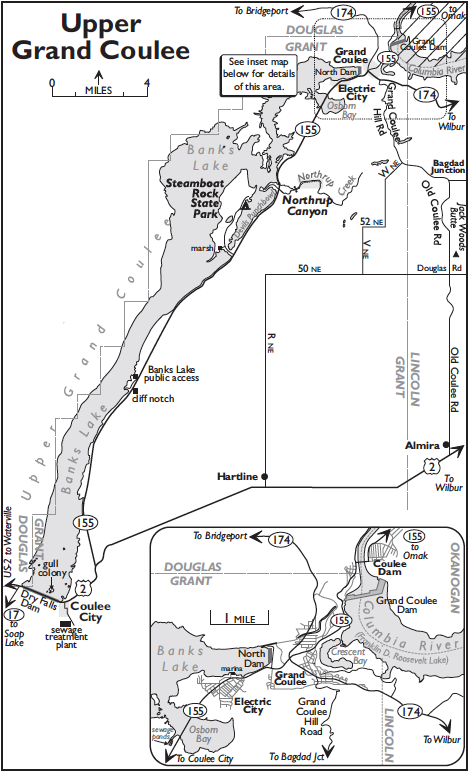 Returning to SR-155, turn right, passing small Jones Bay at 1.7 miles, then crossing larger Osborn Bay (2.4 miles). On both, look for Western and Clark’s Grebes, which nest. Fall and early winter see the arrival of thousands of waterfowl of many species. In Electric City the small boat launch and marina (1.6 miles) often has many diving ducks, and the booms in the bay attract gulls in late fall and early winter. Ring-billed, California, Herring, and Glaucous-winged are the regular species. Rarer species include Sabine’s, Bonaparte’s, Thayer’s, Iceland (once, November), and Glaucous. In 0.5 mile turn left from SR-155, park, and walk onto North Dam. Scan this end of the lake for waterfowl (especially Common Goldeneye in the colder months), loons, grebes, and gulls (especially Herring). Cruising the residential streets in Electric City and the nearby towns of Grand Coulee and Coulee Dam can yield Bohemian Waxwing and Common Redpoll in winter. The plateau above Grand Coulee is known in winter for Gray Partridge, Rough-legged Hawk, Snowy and Short-eared Owls, Gyrfalcon, Prairie Falcon, Northern Shrike, Horned Lark (abundant), Bohemian Waxwing (junipers around the isolated farmhouses), Lapland Longspur, Snow Bunting, and Gray-crowned Rosy-Finch. However, it is best avoided when conditions of fog or drifting snow prevail. From the North Dam approach road, continue east on SR-155 to its junction with SR-174 (0.4 mile). Turn right (south) onto SR-174 and go 0.5 mile to Spokane Way (keep an eye out for Wild Turkeys). Turn right onto Spokane Way (becomes Grand Coulee Hill Road) and climb steeply to a junction (4.7 miles). Bear left (east) here (road name changes to Old Coulee Road at the Lincoln County line) to Bagdad Junction (2.2 miles). This expansive plateau country is grown to wheat. The best strategy is to drive the main, plowed section roads, looking for birds. The highest part of the plateau, and possibly the best for birds, is reached by continuing south on Old Coulee Road from Bagdad Junction to Jack Woods Butte (elevation 2,818 feet), just northeast of the junction with Douglas Road (4.0 miles). From here you can bird graveled Douglas Road westward for the next eight miles (road changes name to Road 50 NE at the Grant County line) to the intersection with Road R NE. From here, you can either proceed south on Road R nine miles to US-2, at Hartline just east of Coulee City, or you can return to Grand Coulee. To reach Grand Coulee Dam, take SR-155 two miles north from Grand Coulee. The mile-wide dam, completed in 1941, backs up the Columbia River more than 150 miles. Tours are offered into the innards of this gigantic structure, where a cavernous room is lined with 24 enormous turbines that generate enough power to supply the needs of two cities the size of Seattle. The dam has also been a salmon exterminator; no fish ladders were constructed to surmount this monumental barrier. Check the roiling waters below the dam from fall through spring for Common Merganser, gulls, and dippers. In winter, protected waters behind the dam may have diving ducks, loons, grebes, Bald Eagle, and loafing gulls.